My real-life friend Kelly offered up this little tip for me to share with you. Kelly just had a bunch of painting done at her house, and she knew, with a houseful of sons, that frequent touch-ups would be required. So before she sealed up each can of paint, she put a small amount of each color in a separate glass jar, and she labeled each jar for its specific room. Now, when she needs to do a touch-up, she doesn't have to lug out the entire can of paint, and deal with the messy lid. She simply gets the appropriate glass jar and a small paintbrush, and she's all set for a quick repair job. 29. The Happy Housewife ~ Got Preschoolers? 64. Amy - annoyed by kids music? 161. Hadley~contact cases and lipstick!! 257. Martie\'s House... make your movies CLEAN!! 260. Tons of Sons ~ coolest software!!! Awesome idea, I just painted my whole house! You have some smart friends! Oh, that is a great idea! I'll bet the paint keeps better that way too. It always seems that a 1/2 empty paint can goes bad in a year or so. Maybe a smaller jar filled to the top (less air in it) would keep better? Not THAT is a great idea! We won't be painting until the kids are old enough that they won't wreck it IMMEDIATELY, but I'll remember this for when we do! I sure wish we had some extra paint left for us by the previous owners of our house. We do something similar by saving what's left of paint we might need again in these Rubbermaid paint containers. We use the label to write the paint color and room name. The paint stays better longer, and I never have to pry off a rusty paint lid! I also wanted to thank you Shannon for hosting the WFMW carnival. It's a lot of fun for us, but I'm sure it's a lot of work for you. So, thank you - your efforts are appreciated! Boy, I wish I would have done this when we painted our entire house! Every room is a different color and needs touch ups. I am not looking forward to trying to find which paint I need where and dealing with the yucky lid. What a great idea! I am SO doing this next time I get that paint out! Thanks! Love this idea! I may get out there to the garage tomorrow, and flll me some jars...thanks! I am painting someones house right now and just went out and bought some new quart containers to make up a little "Home Kit" for the new owners. This is an excellent tip! Thanks Shannon! This is a really great tip, that is going to change our lives. Paint peels so badly in the hot Arizona sun and we never have the right thing around to go and match colors with. Thanks for sharing! I love this idea - and I have some painting to do this summer, so I will keep this tip in mind! This is a fabulous idea. We're repainting in a few weeks, and I will for sure keep this in mind. This is a really GREAT idea!! We are FINALLY dwindeling down the entire house remodel project and I was just wondering what to do with the extra paint! Thanks!! That is such a fabulous idea Shannon. I can think of at least three spots in my house that I wish I could touch up with matching paint. Genius idea! What a super idea. I still have 3 nearly-empty paint cans in the hall closet - think I'll do this tomorrow! I've always wanted to get these ballpoint paint pens for those quick touch up jobs. No paint brush required. My house has about 8 different colors in it so going through the mostly empty gallon jars is a pain. This is the kind of idea that is so obvious and so brilliant that we should have heard about it on Martha Stewart or Rachel Ray before. Thanks! This is a great tip. I also like to add the extra sticker they give you at the store to a page in my household notebook, just in case we have to have more paint mixed up. The one on the can usually gets so messy! THIS, my friend, is a fabulous idea!! The paint jar idea is very smart! Fabulous tip that I will definitely be utilizing soon! My hubby did this, too, when the kids were little and he was constantly touching up the walls. He used old peanut butter jars. That's a great idea. I wish I had done that when we painted the whole house. Hubby has a habit of "patching" things that only he can see :P, so we have little white spots everywhere...if only I had a mini jar!!! Neat idea; I'll have to remember that the next time we paint. Have a great week! Thanks for this great idea Shannon! Oh, good idea! I have a file folder where I keep all of my home info, and I include paint chips from all of the different rooms. If I'm shopping for decor, I can take along the paint chips to get a better idea of what will match. My mother-in-law does this great tip! Oh how I wish the former owners of this house would have thought of that. That is one great idea! That is a really great idea your friend has. I love these tips. So fun and so fabulous! GREAT idea! I have plenty of touching up to do and I dread lugging out the paint cans. I'm definitely going to implement this idea! When we bought our previous house new, the builders left baby food jars of paint for everything including the garage door. They also marked the name and type on each lid so that we could purchase more if we needed to (as they didn't leave the original tins). When we had the whole house repainted after our recent remodel, the painter actually did this for us! So smart. He must have been around kids before. Great idea! I use old film canisters for mine. Remember those? LOL! That's a great idea. Since we're getting ready to paint I'll have to remember it. Once I finally get around to painting, I'll have to remember this idea! That paint tip is a great idea! Then I don't have to wait for hubby to do touch ups! What a great idea. We are getting ready to pain and we will implement this because we have 3 boys and they are pretty destructive. This was my first WFMW post. I hope to continue. I haven't had to paint my kids' room but once but if I decide to paint them again I will use this tip. Thanks. Great idea - I always forget to do this. And the small jars are easier to store in a dark cool place, because the big cans of paint tend to go bad after a while... Very smart! This is a great tip and one I wish I had thought of six years ago when we moved in and painted our entire interior. I can't tell you how many times I've lugged those big ol' paint cans out! This is a great idea...we're in the process of buying a house and I'll be painting both my girls rooms and this is just perfect! Thank you so much for sharing! That's such a great idea. You could also get sample sizes (if possible) of the paint to keep, so you don't have to mess with filling the jars. But not all paint comes in those small sample jars, so this is really helpful for those situations. I just had to go through a bunch of paint the other day to find my living room color for my mom to test to use in her house. It would've been much nicer to have a small jar of it ... much less to stir! Ack! I didn't know you did this every week. The paint idea is great! Man alive. Where were you three years ago when I painted my now much marred family room?? Not to rain on the parade, but that doesn't always work. We tried that, and our touched up areas look a different shade from the rest of the wall. I'm not sure if the wall changed color due to sunlight, if the saved paint didn't get mixed up well or separated over time (even though I shook it up really well), or if if the wall is so dingy the new paint shows up (sadly I think that's the case). We now have a spot that hides my son's art, but it still stands out and we need to repaint the whole wall. Thanks for hosting this. I always learn so much. That's a great paint tip. We're building a house, painting soon & I will definately use that tip! Thanks! I have done this also, but a warning: make sure the lid and rim are very clean and dry of any paint or else you will never get the lid off again! That is the one big downside to this method. I think there's a reason those paint lids are made to pry off! I love this idea. I actually first saw this on a friend's blog where she not only filled the jars but used them as part of her decor. She says, "The jars looked so pretty full, and then I realized that they matched everything (of course). So.... what can I say?" Awesome idea! Those big ol' paint cans are a pain...this is soooo much easier. Thanks for sharing! What a clever idea! ThanX for the useful tip. When will you have the backwards edition of WFMW? Wow what a brilliant idea! I'll be using this tip in the future. Thanks. I love WFMW and all the great tips the readers have! And please thank Kelly for that great paint jar tip, I'm about to start painting rooms and I love this idea! Now that is a GREAT tip! We just had to go buy a new quart of paint because we couldn't find the old gallon in the abyss of the garage :) Passing this along to my husband tomorrow! Great idea, now why didn't I think of that!? Such a fabulous tip! 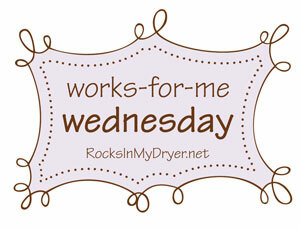 And I love the idea of "Works for me Wednesdays". I'd never heard of them before but now I'll definitely be participating! Woohoo!